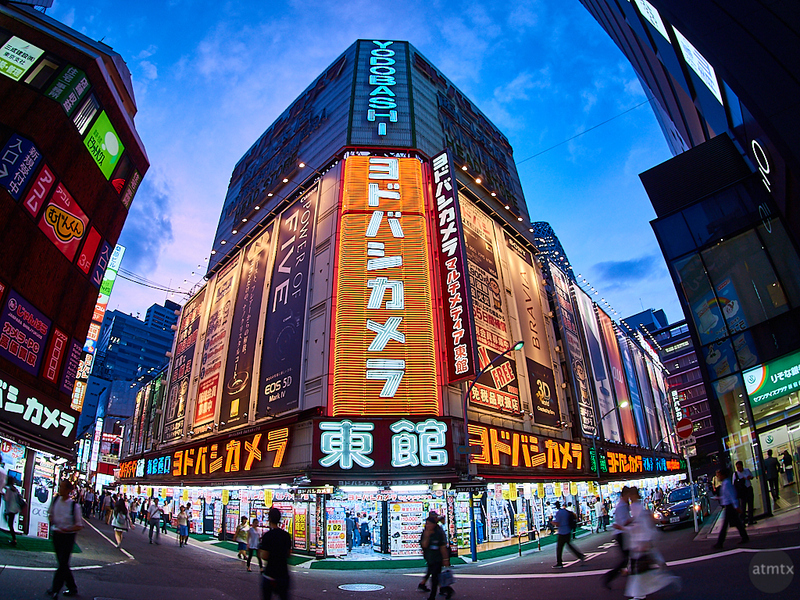 This is the flagship of the famous Yodobashi Camera in Shinjiku, Tokyo. They started here as a small camera store and expanded to include home electronics as it took over neighboring buildings. In addition to this large store, there are about a dozen smaller specialized Yodobashi stores in the area. There’s even a floor dedicated to film. It’s kind of like a Best Buy in the U.S. but more than 10 times larger. I took this with the Olympus Fisheye Bodycap lens on the E-M5 Mark II. Considering it’s a fixed f8 lens, this came out better than I expected at night. I shot it at 0.1 second shutter speed to get ISO 250. I purchased two cameras in Japan this time, but neither at Yodobashi. And both are very modest and inexpensive. At Amazon Japan, of all places, I got myself a Sun & Cloud camera by Superheadz. This 3MP camera is a cousin of the Digital Harinezumi camera that I reviewed a couple of years back. The image quality is about the same but it’s solar-powered. It may be the first and only solar-powered camera. You can also charged it via a hand crank and a standard USB plug. I’ve seen it selling as high as $199 and on Amazon U.S. for $40. I got it in Japan for about $20 delivered, which seemed reasonable for a fun and unique gadget camera. I also picked up a Olympus 35 EC 2, a film camera from 1969. I found it in great condition, in a small film processing store, in an underground mall. Unfortunately, it doesn’t work. I wanted a cheap, nice looking old-fashioned metal camera that I can display at work. I picked this up for about $8.75. That’s it. I was very restrained on my purchases this time, unlike 2 1/2 years ago when I bought a complete Pentax Q7 setup. There are certainly a lot of nice cameras, but as I looked through Yodobashi and some used camera stores, I honestly wasn’t tempted. Currently, I have all the cameras I need, both as a collector and for daily shooting. I suppose, even I have limits to my G.A.S. (Gear Acquisition Syndrome). That’s not to say, if there are major advances in digital, I might be interested again. For now, I’m really happy with my Olympus cameras. The Olympus 35 is a camera I need..since my dad gave his away to his favorite child (or, more likely, the one that just does not live an ocean away 😉 ). Thanks for the post. I am quite impressed by the f8 camera! The Olympus 35 shouldn’t been too expensive to buy in working condition. Maybe under $100 on eBay? Yup, f8 is not as much of a problem with effective image stabilization. It’s a rapidly changing technological world, even in photography. Thanks, Michael. Yes, my embarrassingly large camera collection got modest additions.